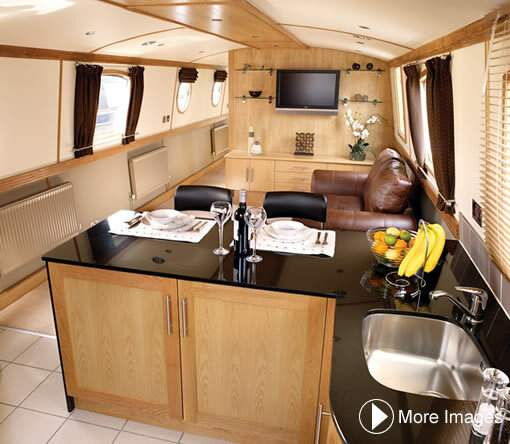 The stylish galley is simple yet striking in design, with ceramic floor tiles, granite worksurfaces and hardwood doors in a choice of styles made from Oak, Ash or Maple. An undermounted stainless steel sink with chrome Monobloc tap is situated on one side of the kitchen with a stainless New World double oven and New World 4 burner gas hob on the other. Plenty of storage is provided by cupboards and corner shelving and the granite worksurface extends into a breakfast bar into the living area. A 240v fridge and a washing machine complete the appliances with the option to fit a freezer or dishwasher for added convenience.